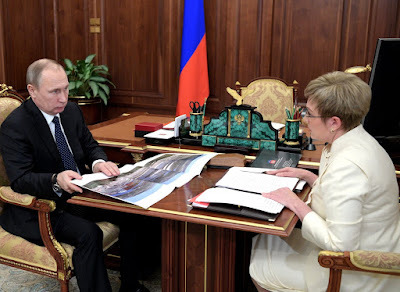 Vladimir Putin had a working meeting with Murmansk Region Governor Marina Kovtun, who briefed the President on the region’s socioeconomic situation and large investment and environmental projects. Good afternoon. Let us take a look at the situation in the region. Mr. President, I would like to start with our performance in 2016 and the current situation in the region. The results of our socioeconomic performance last year are evidence of economic stability, and some indicators point to positive trends. We can report industrial production growth for the second year running. 2016 yearend growth will be 2 percent year on year, mostly due to our mining and metals sectors. Investment in fixed capital has increased 20 percent up to 48.2 billion rubles for the first 10 months of the past year. Corporate revenues have increased 50 percent and freight turnover 12 percent. According to estimates, our 2016 gross regional product increased by more than 0.4 percent. Industrial production and transportation companies account for almost half of the gross added value and over 60 percent of extra-budgetary investment. Large industrial companies, which we see as our flagship companies, form the basis of the region’s economic stability. These include the Kola Mining and Metallurgical Company of Norilsk Nickel, PhosAgro’s mining and processing company Apatit, and [Eurochem’s] Kovdorsky GOK mining and processing. Thanks to these companies tax revenue has increased by over 13.5 percent and we have used these funds to reach our priority goals. One goal was to raise wages in the public sector, which we increased by 6.2 percent on October 1. We have also decreased the Murmansk Region’s sovereign debt and so reduced our debts. According to the federal Ministry of Finance, the Murmansk Region is a region with a high quality of management. We are proud of this evaluation. We had a deficit-free budget in 2016 and plan to have a minor budget surplus of 70 million rubles in 2017. We reduced our sovereign debt to 41 percent from 46 percent in 2015 and the commercial part of our sovereign debt from 67 to 53 percent. This year, we will continue working to increase the efficiency of our budgetary spending, that is, the use of budgetary funds. Our priority is certainly May 2012 executive orders. Over the past four years, the Murmansk Region has been one of the three leading regions in terms of complying with the May executive orders in the Northwestern Federal District. We will review the main results after the publication of the official statistics, but even now our estimates indicate that we have executed the May executive orders in full. I would like to say a few words about salaries. In general, the private sector has seen an average salary increase of 5.5 percent to 47,390 rubles. In the public sector, the growth is somewhat lower: 4.2 percent, with average salaries at about 42,710 rubles. Generally, there is growth, but not in real terms, where it has even declined by 2 percent. The situation on the labor market is stable. The official unemployment rate is 1.5 percent, or even lower than the same period last year. According to the 2016 results (as tabulated by the Federal Government), the Murmansk Region has joined the top 20 regions with the best socioeconomic development results; we will even receive a bonus worth 218 million rubles from the Finance Ministry. Of course, our main goal is to enhance the region’s investment appeal and improve the investment climate. We have created an investment support system in the region that is equally efficient in working with both major and small investors. As of today, we have signed twelve investment agreements on state support for strategic and priority projects (we have a classification for this). These investments will total over 90 billion rubles and more than 7,000 jobs will be created. Let me list just a few projects. They include NOVATEK projects to establish a center for the construction of large-capacity offshore installations on the western coast of Kola Bay. After receiving an endorsement from the government expert review panel, the company will start on the project later this year. In 2017, as planned, we expect Rosneft to implement its projects to create an onshore support base for offshore projects. The total amount of investment for 2017–2030, as stated by Rosneft, is estimated at 120 billion rubles. NOVATEK’s investment will be some 25 billion rubles plus 3,000 new jobs. Of course, this is an important project for us. As far as Rosneft projects are concerned, we, as per your executive order, have delineated the village of Roslyakovo, and Murmansk has annexed it. Now there are no obstacles to inviting foreign investors there. The Kola Mining and Metallurgical Company (Norilsk Nickel) remains one of our major investors. They are implementing a number of investment projects and the total volume of investment amounts to over 20 billion rubles. The major projects include the creation of a cobalt and nickel electroextraction plant. The Kola Peninsula is now home to the world’s largest nickel refinery. Almost all nickel production plants have been transferred to the Kola Peninsula. Norilsk Nickel pays a great deal of attention to the environment. The company’s environmental footprint has been reduced, including a reduction in Sulphur dioxide emissions, which have been cut by more than a quarter, and a two-time reduction in carbon monoxide emissions. A visitor center of the Pasvik nature reserve will open soon. This is an environmental project implemented by Norilsk Nickel. It will be a powerful international environmental platform for environmental education of the people of Russia, and the border areas of Norway and Finland. Mr. President, I would like to take a moment to talk about the Year of the Environment. Your executive order announced 2017 the Year of the Environment, and I would like to tell you about a project that has been implemented on the Kola Peninsula. It took us 12 years to complete. I’m sure you are aware of it. This is what it looks like. (Watching a presentation.) This is probably one of the most important environmental projects associated with the elimination of the Soviet nuclear legacy. Yes, the disposal of submarines. It was implemented by the Rosatom State Corporation in conjunction with their German colleagues. Germany alone has invested over 600 million euros at various phases of this project. An important nuclear waste management project has been implemented, and a lot of work has been done. I have already mentioned that the project was implemented over the course of 12 years. The main partners were the Russian Kurchatov Institute and the German Energiewerke Nord. Here’s what we have accomplished. The place is called Sayda Bay. It is now completely environmentally safe. We have built the infrastructure for getting rid of nuclear submarines and introduced an effective nuclear waste management system. This is a major complex which can accommodate 155 reactor compartments from nuclear submarines. This project is unparalleled in terms of technology and safety. Mr. President, I would like to take this opportunity to invite you to visit this unique facility. I think it's worthwhile, because, really, it's the work of an outstanding Russian-German team (it is not just an engineering team, but also a creative team), and, one must give credit where credit is due, this is a one-of-a-kind project, which resolves the issue of long-term nuclear waste storage, not only in northwestern Russia, but the entire Arctic as well. Vladimir Putin meeting with Murmansk Region Governor Marina Kovtun. 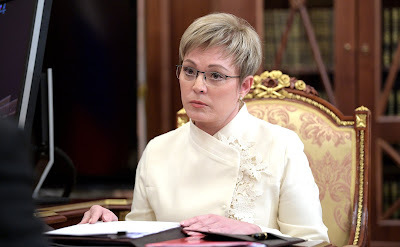 Marina Kovtun, Murmansk Region Governor. 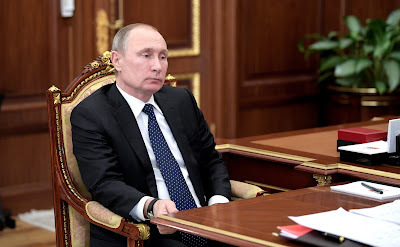 Vladimir Putin at the meeting with Marina Kovtun. 0 Comment to "Putin met with Murmansk Region Governor Marina Kovtun"